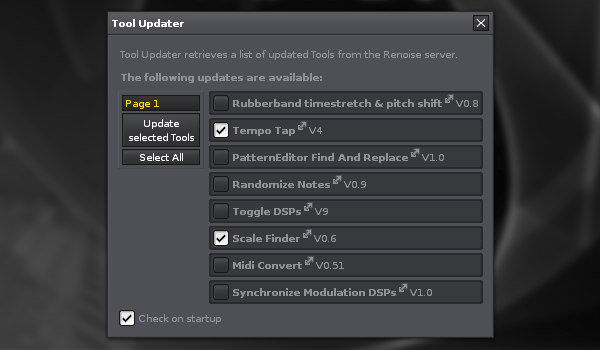 Tool Updater will look for updates for your installed tools on tools.renoise.com. If there are any updates, you will get a dialog to choose for which tools you want to download and install the update. After successful installation the dialog will close automatically. Tool Updater also helps easing the transition when upgrading Renoise. Any tools you had in Renoise 2.6 will be copied and installed into Renoise 2.7, but will be deactivated because they are incompatible. Tool Updater will search and install new, compatible versions of those outdated tools. Optionally you can let Tool Updater check for updates whenever Renoise starts. One user reported that the Kaspersky anti-virus software may block updates containing executables, causing Renoise to become non-responsive. The solution is to properly whitelist Renoise. Current Tools containing executables are Rubberband Timestretch/Pitch-shift and Create Tool Tool and Export Tool Tool.